Quote: "Hey, do you want me to sign your game controller? That ought to cheer you right up!" 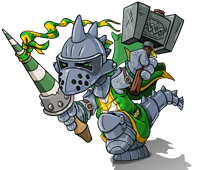 Chadrick Woolsworth Tuffington IV is the most popular Neopet in AAA's class. In fact, he's the most famous Zafara in the entire school. 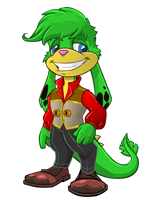 The Neopian Times reports that his smile was rated Most Charming in Neopia for three years running. In Year 15, when his classmate AAA famously went AWOL instead of launching the Daily Dare, Chadrick (known as Chadley to his many friends) graciously offered to take over the prestigious gaming event. It was a big responsibility, but as Chadley pointed out, "When you're as famous as me, keeping it cool comes naturally. I know Daily Dare is important to my fans, and I don't want them to be disappointed." "AAA, you're back!" Chadley grinned. His trademarked smile never failed to win over his classmates... with one exception: Aristotle A. Avinroo, the annoying self-styled Gamesmaster. As if game scores were more important than having fans! Chadley noticed with surprise that AAA looked like a thundercloud in the doorway, floating in his silly gaming chair. "You're holding my game controller," the Blumaroo said in a tight voice. His head was bigger than ever -- had it grown over the summer? "Drop it now, please." "Oh, come on, AAA. Don't be like that," Chadley began, his grin drooping slightly. "Abby and I have been making Daily Dare history! You know, maybe you should just sneak back out the door and let us finish. I had a great idea for the final day with fireworks that spelled out my name--"
BOOM. The robotic arm of AAA's chair sent Chadley through the window, arcing upward into the sky. He had a great view of Roo Island as he flew out over the sea. He could concede gracefully, Chadley decided as the water came rushing up at him. He was done with Daily Dare for a while, anyway. Yeah, that sounded cool.